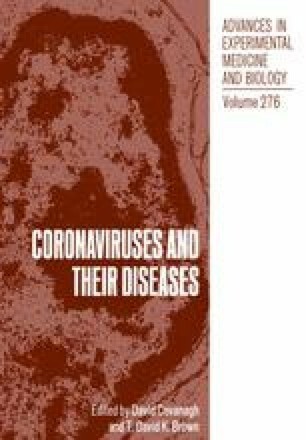 The JHM strain of mouse hepatitis virus (MHV-JHM) is a member of the Coronavirus family, which experimentally induces encephalomyelitiS in susceptible mice and rats. In surviving animals a chronic white matter disease ensues. The development of demyelinating lesions is thought to be a primary effect of infection of oligodendrocytes.2, 3 MHV-JHM virus has been shown to persist in the infected brain as long as 1 year after infection. Persistent infections of mice with other strains of MHV such as MHV-A59 and MHV-3 have also been reported.4,5,6 Murine coronaviruses have four structural proteins: a matrix like transmembrane glycoprotein (El), a nucleocapsid protein (N), a peplomer protein (E2), and for some laboratory strains of MHV-JHM a 65,000 Daglycoprotein. 7,8 The E2 glycoprotein (180,000 Da) is responsible for the attachment of MHV to the host cell plasma membrane, induction of cell-to-cell fusion and eliciting of the production of neutralizing antibody. 9,10 In the course of immunological staining of MHV-infected cells with rabbit antisera we observed at moderate dilution (1:50 – 1:100) normal and preimmune serum stained MHV-JHM infected, but not uninfected, cells. This staining could not be removed by absorption of rabbit antiserum with uninfected cells. This observation suggested that infection of cells with MHV may result in the expression of receptors for the Fc region of immunoglobulin G (IgG).